If you've been in a computer store recently, you no doubt are aware of the way the computing mainstream is embracing the whole PC modding craze. What used to be the solitary pastime of a few geeks with Dremels and too much free time is now a full scale industry, and even major computer retail chains are selling 'enthusiast' parts like LED case fans and UV case lights. The most noticeable product of this trend though, is the sale of 'pre-modded' cases, offering the computer enthusiast the chance to show his or her hobby off without having to go to the trouble of actually modifying their case themselves. Several companies specialize in producing a variety of wild and wacky case designs sporting everything from plastic windows to custom fans, knobs, lights and creatures bursting out in pre-molded plastic. While we here at PCSTATS pride ourselves on being mostly immune to trends, a few of these cases have managed to catch even our jaded eye, and today we're going to look at one of the most striking of them all. 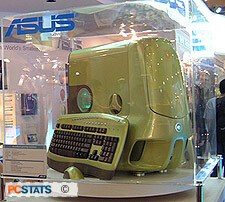 It was while striding through the ASUS exhibit at Computex 2004 in Taipei that we first noticed the Vento 3600 case. Something about its looks captured our imagination. Beyond merely housing a computer, the Vento seemed to be begging us to leap onto it, fire up the engines and shoot off through the trees of Endor, dodging Imperial Scouts as we went... yes, it looked pretty cool. It was also behind glass, so we couldn't play with it. Well, we've finally got our hands on one of these cases, so it's time to see if cold, hard reality measures up to the 'wow' factor that the Vento 3600 case evoked in us. The ASUS Vento 3600 comes in three colours; red, green and blue. Our review model sported the blue colour. 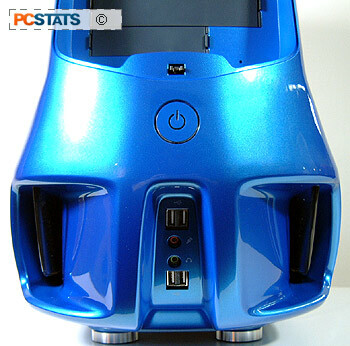 The outer shell is painted plastic and features an 'airlock' style detachable side panel as well as a self-opening front panel concealing the drive bays. Instructions and necessary mounting hardware (screws). No power supply is included. 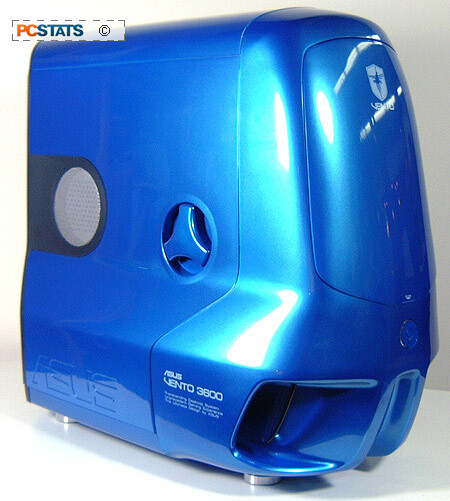 The Vento 3600 case has a large 12" x 25" footprint and measures about 21" tall. It is considerably larger than your average computer case, and thanks to its all-steel 0.8mm SECC internal construction, its weight reflects this. The Vento 3600 easily weighs as much as a typical fully installed ATX case does before you install a motherboard or other components. It's still moveable though, fortunately. The front panel of the Vento features a full 4 USB 2.0 ports as well as a headphone and microphone jacks. It also has a hinged front panel which covers the external drive bays. When pressed, this panel slides up and over the front of the case, resting on the top. The case features screwless installation of external drives and expansion cards via a locking lever system. Four 5.25 inch drive bays are provided as well as 1 external and three internal 3.5 inch bays. Seven rear expansion slots are present. A front 80mm fan and a rear transparent 120mm fan are included, and air flow is provided by twin front 'air scoop' inlets and a side panel air vent positioned over the processor which includes a plastic wind tunnel designed to funnel fresh air directly down onto the heatsink fan. A power supply is not included with the Vento 3600 case. A innovative plastic cable management assembly is mounted to the rear of the case. This is a detachable bracket which covers the rear of the entire case, and is helpful for organizing wires. It isn't strong enough th be used as a handle though.